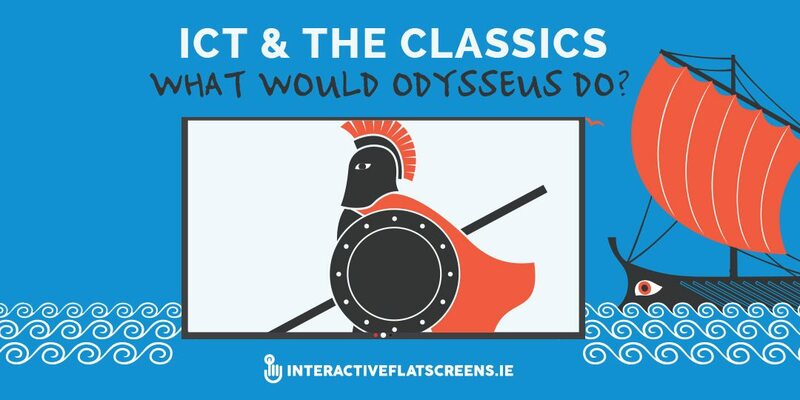 ICT & The Classics – What Would Odysseus Do? 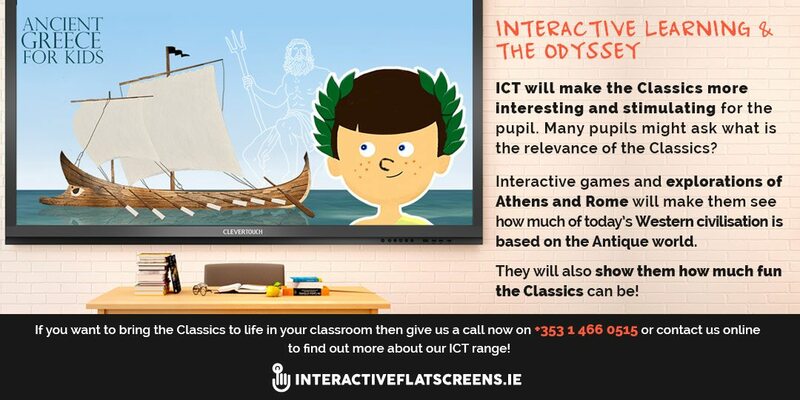 How can ICT in the classroom help the Classics to survive? We owe so much to the Classical civilisations. For hundreds of years learning Ancient Greek or Latin was essential for an education and it was through these languages that students encountered the worlds of Ancient Greece and Ancient Rome. These days the Classics are neglected at all levels of education. This is a pity as we have so much to learn from the Classical authors. The epicists Homer and Virgil. The tragedians Aeschylus, Sophocles and Euripides. The philosophers Plato and Aristotle. The historians Plutarch and Seutonius. If the Classics are to survive, two measures need to be taken: learning through translation needs to become the norm and pupils should be introduced to the Classics at a younger age i.e. during primary and secondary education. The advent of ICT in the classroom will also help the Classics to survive. How is this so? Learning the Classics involves many different disciplines: history, philosophy, literature, geography, architecture, to name a few. You are learning about a whole world that existed for over a thousand years. That is a lot of information to take in. The iPad, tablet or touch screen will give the pupil instant access to that information just as the interactive flat screen will do so for the teacher. The whole Classical world will be at your fingertips. Of course, the interactive nature of learning through ICT will make the Classics more interesting and stimulating for the pupil. Many pupils might ask what is the relevance of the Classics? Interactive games and explorations of Athens and Rome will make them see how much of today’s Western civilisation is based on the Antique world. They will also show them how much fun the Classics can be! Homer’s Odyssey has always been a favourite of students of the Classical world. Because it is such a great story with so much imagination it will appeal to pupils at primary level. The advent of teaching apps and interactive learning will make the story come to life for young minds. Indeed, it could be argued that the survival of the Classics for a large part depends on Homer as reading him will get pupils hooked from a young age. Of course, a good teacher who knows the joys of the Classics will also help. There are those who would argue that teaching the Classics through these apps is a dumbing down of the subject. This is the wrong way to look at it. It is important to get pupils interested from a young age so they can go on to explore the Classics in a more disciplined, academic way when they are older. Interactive technology will help to get more young minds interested in the Ancient world. Of course, the interactive flat panel will also make life easier for the teacher of the Classics. Maps, buildings and sculptures can be summoned with ease without any of the hassles associated with traditional projectors. All it takes is a fingertip. 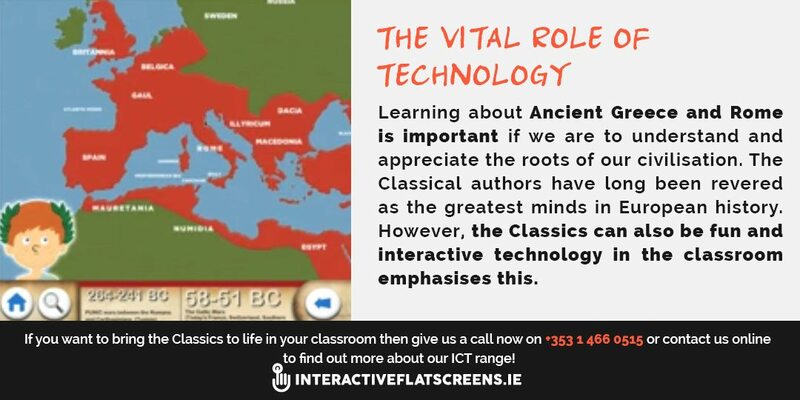 The interactive touch monitor will also show films so you can treat your students to a viewing of movies about the Classical world such as Troy and Gladiator. Learning about Ancient Greece and Rome is important if we are to understand and appreciate the roots of our civilisation. The Classical authors have long been revered as the greatest minds in European history. However, the Classics can also be fun and interactive technology in the classroom emphasizes this. If the discipline is to survive, this technology will play a vital role as it will get fresh minds interested and put them on the path to studying the Classics when they are older. To find out which interactive flat screens will best suit you classroom and needs then give us a call now on +353 1 466 0515 or contact us online for more info!